The world of vegan dining has certainly grown. If you're living a meat and dairy-free life, you'll find plenty of options in Brooklyn. 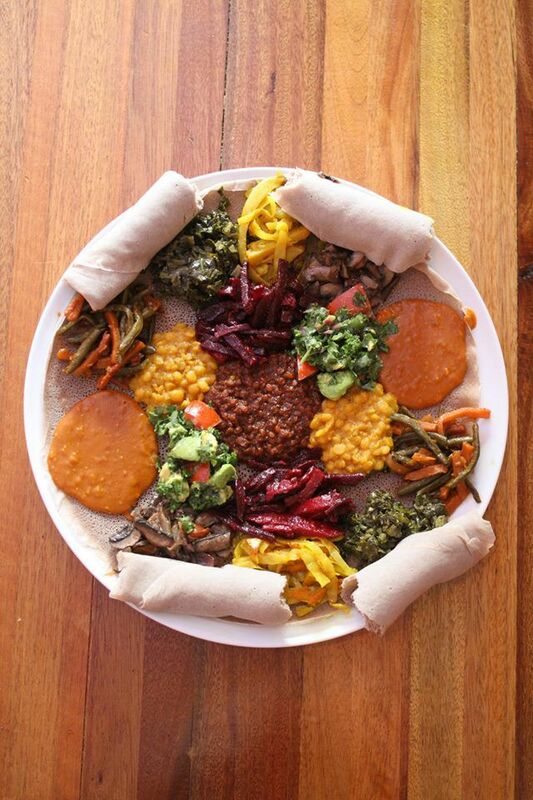 From a trendy vegan doughnut shop to Ethiopian food in Bushwick, there are tons of options. Enjoy dining at these vegan-friendly restaurants in Brooklyn. If you've been craving a cheeseburger (made of lentils) or a Casino Dog (veggie hot dog), stop in Toad Style. Located in Bed Stuy, Brooklyn's increasingly hip neighborhood, Toad Hall's food is packed with flavor. Order the BBQ Pulled Jackfruit sandwich and a side of fried pickles, and devour this meat-free fantastic food. A vegan doughnut shop in East Williamsburg—what more is there to say? Since 2011 Dun-Well has been a hit with locals and visitors. The shop has over two hundred flavors, and they make a limited batch of various flavors each day. They also bake doughnuts twice daily, so you don’t have to wake up at the crack of dawn to get your doughnut fix. Flavors include Earl Grey Tea, The Elvis, Pecan Pie, and many others. Enjoy a taco breakfast and a mimosa at this Park Slope Latin-vegan restaurant. Dinner choices include arepas, kale tostadas, avocado fries and other vegan treats at this beloved local restaurant, which also has locations in the East Village and Gramercy. Located in North Slope on bustling Fifth Avenue, V Spot is a short walk from Barclays Center. Toss your good manners aside as you eat with your hands at this Ethiopian restaurant in hyper trendy Bushwick/East Williamsburg. Before you spend the afternoon checking out the noted street art in this area, head to Bunna Cafe for tasty and filling vegan brunch. Or bring some friends and order a "feast" for dinner. Order a beet burger, tempeh reuben, and other vegan entrees at the Jungle Cafe in Greenpoint. Juice fans should peruse the jungle juice menu. which includes the Amazon Sunrise (Carrot & orange juice), Cool Breeze (Apple, Cucumber, Celery, Pineapple, Mint, and Lemon) or Smiling Sloth (Pineapple, Apple, Orange juice), among other inventive juice combos. This veggie cafe on Williamsburg's Bedford Avenue is a neighborhood staple. For years, Bliss Cafe has been serving breakfast, lunch, and dinner. Enjoy people watching in this flavorful hipster-filled hood as you dine on vegan french toast and soy milk. Although vegans have many options while dining at Asian restaurants, Luanne's Wild Ginger All-Asian on Smith Street, just a few blocks from downtown Brooklyn, has an entire menu of vegan-friendly eats. Whatever you do, please don't leave without ordering dumplings, they're exceptional. Wild Ginger is a Williamsburg favorite. For years, this Pan-Asian vegan cafe has been serving folks some of the tastiest Asian food in the borough. This is truly one of those rare veggie restaurants that will please both carnivores and veggies because the food is flavorful and filling. Don't forget to order a vegan Thai iced tea.